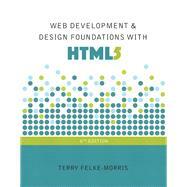 For courses in web development and design. Terry Ann Felke-Morris is a Professor Emerita of Computer Information Systems at William Rainey Harper College in Palatine, Illinois. She holds a Doctor of Education degree, a Master of Science degree in information systems, and numerous certifications, including Adobe Certified Dreamweaver 8 Developer, WOW Certified Associate Webmaster, Microsoft Certified Professional, Master CIW Designer, and CIW Certified Instructor. Dr. Felke-Morris has been honored with Harper College’s Glenn A. Reich Memorial Award for Instructional Technology in recognition of her work in designing the college’s Web Development program and courses. In 2006, she received the Blackboard Greenhouse Exemplary Online Course Award for use of Internet technology in the academic environment. Dr. Felke-Morris received two international awards in 2008: the Instructional Technology Council’s Outstanding e-Learning Faculty Award for Excellence and the MERLOT Award for Exemplary Online Learning Resources—MERLOT Business Classics. With more than 25 years of information technology experience in business and industry, Dr. Felke-Morris published her first website in 1996 and has been working with the Web ever since. A long-time promoter of Web standards, she was a member of the Web Standards Project Education Task Force. Dr. Felke-Morris was instrumental in developing the Web Development certificate and degree programs at William Rainey Harper College. For more information about Dr. Terry Ann Felke-Morris, visit http://terrymorris.net.